Folks in the startup world love to talk about capital raises, often time equating them with success. That is often not the case and the people over at Exitround have put together an analysis on tech M&A that makes this clear. They call it the exit curve. 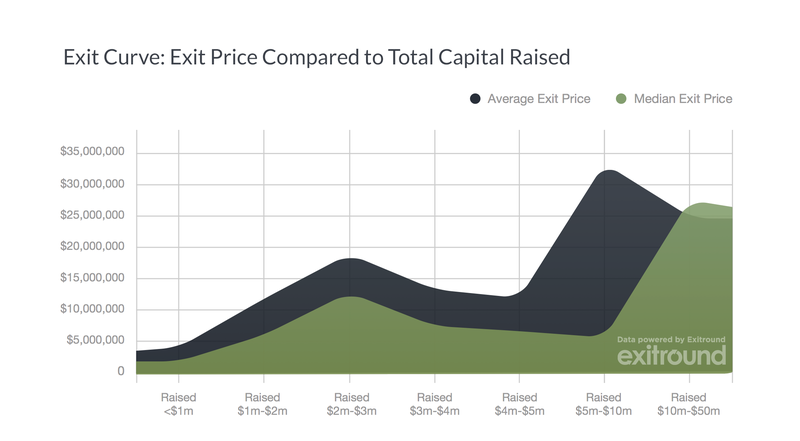 To build this curve Exitround looked at more than 200 exits that took place over the past five years using data from startup accelerators such as YC and TechStars. The studies focused on exits less than $100 million as they account for 88% of acquisitions. It is evident when looking at the graph that raising more funding is not necessarily a good thing. Those twin camel humps in the $2 million to $3 million and $5 million to $10 million range illustrate the optimal capital required to create the best returns. Exit price does not materially increase until a company is at least four years old. The big takeaway that both entrepreneurs and investors should heed is that when it comes to raising capital sometimes less is more.